The Prince of Wales wants to end his role as a promoter of British arms in Gulf States where possible, according to his new biography. The unauthorized book, ‘Charles: Heart of a King’, is due to be published on Thursday. It was written by Catherine Mayer, an American-born, UK-educated, London-based journalist. Reflecting on the biography, Mayer told the BBC there is a significant gap between the public’s perception of Prince Charles and the man behind the image. “A source close to the Prince says he doesn’t like being used to market weaponry and now sidesteps such activities where possible,” Mayer writes. Smith warned while the UK government talks about promoting democracy, back-room British business deals often result in serious human rights violations. “Unfortunately when it comes to business, human rights will often play second fiddle to the short term profits of the arms companies,” he said. Prince Charles’ alleged concerns over his unofficial role as a marketing agent for British arms abroad is yet to prompt tangible tension in Westminster’s quarters. But his current perspective on the matter, as unveiled by Mayer’s book, means he is unlikely to be attending arms fairs in the coming months. Despite the Prince of Wales' recent aversion to peddling arms in Middle Eastern states, he has not always shied away from such a role. 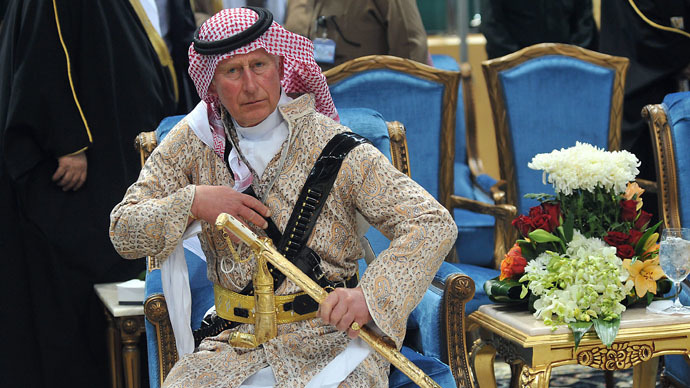 Rumours that Prince Charles is Britain’s secret weapon in dealing with Gulf States were compounded when his visit to Saudi Arabia in 2014 was swiftly followed by a noteworthy arms deal. UK aerospace firm BAE Systems officially announced the completion of an agreement to broker Typhoon jets to the Saudi government a mere day after the Prince of Wales departed from the Saudi capital of Riyadh. And in a documentary made in 1994, Prince Charles defended his appearance at an arms fair in Dubai. He said at the time his presence at the event helped to boost British trade. Prince Charles is regarded by the Foreign Office as a highly valuable asset, as he has the ability to gain closer access to senior Arab officials than any minister or diplomat. He is a regular visitor to Arab states, and travelled to Saudi Arabia last month to honor the passing of the nation’s controversial King Abdullah. The prince has a close relationship with the Saudi royal family, ties critics say the Foreign and Commonwealth Office exploit to bolster Britain’s strategic interests. During his upcoming visit to the Middle East, Prince Charles is set to visit five separate states in total. As part of the trip, he will meet Saudi Arabia’s newly appointed King Salman. A spokesperson for Clarence House said the visit would not be influenced by the “sale of defense equipment,” and is essentially not commercial in nature. He stressed Charles’ scheduled visit would focus on strengthening key relationships and “highlighting stability” in the Middle East - and that the states the Prince will visit are “important allies” and “key partners” of Britain. The UK government’s recent decision to fly flags at half-mast over state buildings to commemorate the death of King Abdullah unleashed a torrent of criticism. Civil liberties advocates sharply criticized the British government for commemorating Abdullah despite Saudi Arabia’s poor human rights record. But British Prime Minister David Cameron defended Britain’s intimate relationship with Saudi Arabia, stressing the country had aided the West in the fight against terrorism. Cameron made particular reference to a tip-off from Saudi intelligence officers that prompted the discovery of a bomb on a cargo plane in an East Midlands airport in 2010. Senior defense chiefs have rejected the notion that Prince Charles previously aided in securing or brokering contracts on behalf of UK arms firms. “Asking the royal family to intervene on our behalf is just not something we do and I don’t ever recall us having used Prince Charles,” a defense executive told The Australian.